I know what you’re thinking. 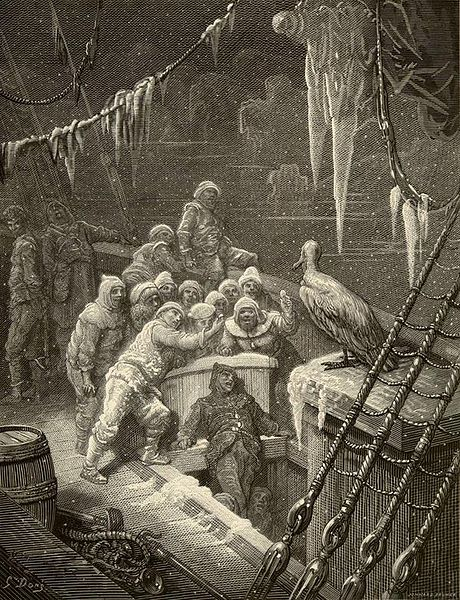 The Rime of the Ancient Mariner is a poem about a crusty old sailor shooting an albatross. Okay, so that might be true… but there’s more to it than that. Really. In case you don’t recall the poem, let me summarize. Essentially, a man is on his way to the wedding of an acquaintance and bumps into an elderly sailor who proceeds to talk his ear off. As the story progresses, the young man is progressively more engaged by the tale of woe until he forgets about attending the nuptials and settles in to hear the rest. This is a story about superstitions and consequences. Without spoiling the content because as poems from the Romantic Period go, it really isn’t all that long (*eye roll*), the old sailor relates the events that occurred on a disastrous voyage. The poem also produced the infamous “albatross about my neck” reference that haunts us still today. Actually, I’m not sure that’s truly the origin of the phrase but we’ll just assume it is for simplicity. Frankly, I never thought about how awkwardly an albatross would be to wear down one’s shirtfront. They’re very large birds. As poems go, epic and otherwise, the language is awkward but the form is easy to plow through. The imagery is florid and not always coherent. According to experts in the era of Romantic works (which I am not), the poem does not fit well with the expectations of the time. There are endless permutations, speculations, and arguments about what the poem “actually” means – I suspect this might have vastly amused Coleridge. This entry was posted on October 3, 2013, 3:14 am and is filed under Classic Literature. You can follow any responses to this entry through RSS 2.0. You can leave a response, or trackback from your own site. I loved reading this poem in the English lit class I took years ago. Go figure though, what most impressed on me was how he wrote Kubla Kahn after taking dose of opium. When writing it, he was interrupted and never captured the flow of the lines again.